The Apple TV's failings...and future? As Steve Jobs prepared to introduce the redesigned, re-priced, and re-thought Apple TV, Macworld contributor Lex Friedman was ready, credit card in hand. Then Jobs described everything it did, and Lex put his credit card right back in his wallet. The new Apple TV simply does too little to earn a spot in his entertainment center. At the same time, senior editor Jonathan Seff (a frequent Apple TV user) was sitting in the audience for the presentation, and was impressed by the updated Apple TV and happy to see Apple pay some much-needed attention to the product. What follows is Lex’s critique of the Apple TV, and Jon’s responses to it. Call it a point-counterpoint—with a little cheating. Lex: It lacks DVR functionality. I was disappointed with the first Apple TV for the same reason. It’s clear now that Apple doesn’t want to get into the DVR market, and that position is understandable: It’s better for Apple if we rent shows from iTunes for a buck, instead of capturing them for later viewing when they’re originally aired. But I don’t want to wait hours (or days!) to watch the latest episode of House, and I don’t want to pay for it, either. Paying $1 to rent a show isn’t terrible. Paying $1 to rent all 20-plus episodes of five or 10 shows starts to get pretty pricey. Jon: Apple isn’t going to sell a DVR, period. Some part of that is to protect the Apple Store, sure, but there are much larger issues at play. All digital TV delivery (including over-the-air) requires some sort of decoder to play. TiVo supports CableCard, which means you can plug devices provided by your cable company into a TiVo so that it can decode shows and record them. The problem is, that only works with cable (and only because Congress forces those companies to support it)—satellite providers such as DirecTV and Dish Network aren’t required to do so, and they don’t. So that leaves out millions of potential customers. The solution, as products such as Elgato’s EyeTV HD ( ) employ, would be to connect to your decoder box (via analog component only, because HDMI uses copy-protection) and then have an IR blaster that would relay commands in order to change the channel on your receiver. Talk about a bag of hurt—does that sound like something Apple would want to get involved in? Lex: The Apple TV’s lack of third-party app support is troubling in multiple ways. The first is its complete lack of ability to stream shows that even my iPad and iPhone can. If I can watch ABC shows (with the ABC app) and NBC and FOX shows (with the Hulu app) and even CNN live video (with the CNN app), I should be able to consume all that content with my Apple TV, too. I can’t. Jon: This redone Apple TV is somewhat new territory for Apple. I suspect that as time goes on, we’ll see improvements to its streaming capabilities. The addition of Netflix’s Watch Instantly service is a great step, and one that should appeal to a lot of people—Netflix boasts more than 15 million subscribers. And Apple’s AirPlay feature will let you stream from your iPad or iPhone directly to the Apple TV, so that opens the gates a little more. Lex: No app support also means no gaming. I concede that it’s clearly not Apple TV’s goal to become a game console, but Apple’s leaving a surprising amount of untapped potential here. With gyroscope-equipped iPhones and iPods that could be used as Wii-style controllers for games on my television, and an App Store full of innovative game developers, the Apple TV could pack in a lot of extra value—and fun! Jon: True, right now the Apple TV can stream only from the iTunes Store, Netflix, or your own iTunes library (plus YouTube, though the usefulness of that feature is rather dubious). But as mentioned above, the addition of Netflix is huge—and a road, quite frankly, I never expected Apple would walk down. And remember that the Apple TV is also the only streaming device on the market that can play content rented or purchased from the iTunes Store (by design, of course). Lex: With Amazon movie purchases, I get the right to re-stream my purchases whenever I’d like. If I buy Monsters, Inc. , say, from the iTunes Store, I must do so from a device other than the Apple TV (which no longer supports purchasing), keep it a computer, and ensure that that computer is on to stream to my hard drive-deprived Apple TV. Amazon’s service lets me stream rentals and purchases alike. Jon: I see the convenience in the way Amazon does things, and it’s a nice option, but for me it’s not that important. My main computer (an iMac) is on when I’m awake, which means it’s available to stream to the Apple TV whenever we want to watch. Yes, that means content needs to be on my computer to stream to the Apple TV, but I’m generally OK with that. On the flip side, although you can watch Amazon content on your computer or, with a compatible streaming device, on your TV, you can’t copy it to an iPod, iPhone, or iPad. 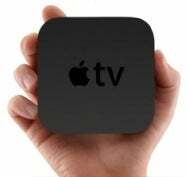 Lex: As is, the Apple TV is at best only interesting to folks who currently don’t own an Internet-equipped TV device—like a TiVo HD or Premiere, Roku, or TV-connected Mac mini. If you already own such a device, there’s little that makes the Apple TV uniquely interesting. For new purchasers, I don’t believe that the Apple TV stacks up favorably against its competitors. Jon: There are lots of options out there, but I think that a small, quiet, $99 Apple TV that lets people already a part of the Apple ecosystem watch content on their TVs instead of just their computers and devices is a powerful thing. It’s targeted to a mass-market audience that doesn’t want to spent a lot of money on hardware and may not be very technical. If it just works, that could be enough. Lex: The Apple TV “only” supports up to 720p. Truth be told, though, this one perceived Apple TV weakness doesn’t bother me. While modern HDTVs support 1080p, networks broadcast their programming in either 720p or 1080i (an interlaced signal that may not even be as smooth a progressive 720p signal), and because of compression strategies employed by cable and satellite companies looking to pack in as many channels as they can, surprisingly little television we receive these days broadcasts in true 1080 (1920 by 1080) anyway. The visual leap from standard definition to 720p high definition is far greater than the short hop from 720 to 1080. Jon: I agree. Apple doesn’t offer 1080p content—which would dramatically increase file sizes and download times—and neither does Netflix (in fact very little of what Netflix streams is even in HD at this point). As those make up the two main areas of content, 1080p isn’t really needed. Sure, YouTube hosts 1080p videos now, and you might have your own 1080p content—footage you shot with your 1080p camcorder and converted to work with iTunes, or Blu-ray movies you’ve purchased and ripped—but again we’re talking about a $99 product, and one that Apple hopes to sell to lots and lots of people who’ve never considered buying an Apple TV before. As such, it doesn’t bother me.